My sister and her fiance had spontaneously stopped over, they were utterly exhausted from working on various projects throughout the day, and did not have the energy to drive the hour back to their house.I found myself happily in the kitchen cooking a spontaneous dinner centered around cheesy, baked mashed potatoes and roasted acorn squash with maple butter and cozy spices. 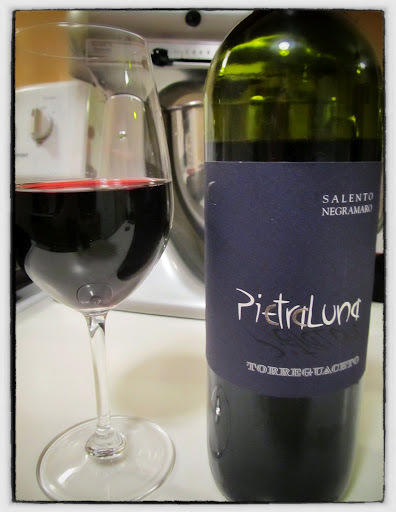 I fancied a rustic, straightforward glass to highlight their autumn flavours, so I enthusiastically gave a pour to Torre Guaceto PeitraLuna Salento Negramaro 2010. PietraLuna [meaning stone moon] was crafted under the aegis of Project Racemi; pioneering winemaker Gregory Perrucci founded Racemi in order to establish “the research, vinification and commercialization of Puglia’s native vineyards and regional varietals”. By unifying numerous small vineyards together under the project, he is able to promote native Puglian varietals on an international level. The vineyards are located in the hills of Torre Guaceto, which is one of southern Italy’s largest nature reserves and are meticulously integrated within the surrounding land and wildlife. The vines are on average 50 years old, and the wine was aged in stainless steel to preserve the fruitiness and bright flavours. Dark garnet with red-violet highlights, after aerating aromas of cherry, cocoa and rich baking spices swirled about in the glass. Tart cherry and plush raisin flavours were supported by balsamic notes and smooth black tea tannins. Bitter almond, dark chocolate and traces of anise composed the invigorating, moderate finish. Rustic and bright, this is a fantastic everyday glass for the table. Estate Bottled by Racemi s.r.l.